The hospitality industry, including travel and tourism, makes up nearly 10% of the global economic GDP. Today we are releasing a brand new taxonomy designed specifically for the businesses in this space: The WAND Hospitality Taxonomy. Included in this taxonomy of 1,127 terms and 354 synonyms are the various types of Travel, Lodging, Dining and Entertainment that are a part of the hospitality experience. You'll also find terms relating to Guests including Reservations, Guest Information, and Customer Loyalty Programs. Hospitality Policies, Protocols and Procedures. The release of this taxonomy fills a major industry gap in our taxonomy library and furthers WAND's mission of having a relevant pre-built taxonomy for every business sector. The WAND Hospitality Taxonomy can be customized to meet the needs of any specific business in the hospitality industry. 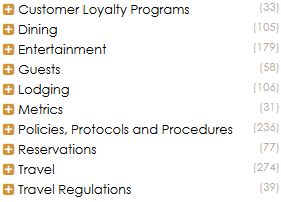 Another WAND Taxonomy that fits nicely with the Hospitality Taxonomy is the WAND Customer Service Taxonomy. As with all WAND Taxonomies, the WAND Hospitality Taxonomy is available by itself or as part of the WAND Taxonomy Library Portal.